We believe, and we will always believe, that there is so much more to wedding photography than just nice equipment. However, that is not to say your wedding photographer shouldn’t have nice equipment. Here is our list of professional equipment. Besides the equipment listed below, we have a variety of tripods, filters, and other accessories. To get an idea of “must-have-equipment” for wedding photographers, check out the “What kind of equipment do you use?” section in our article titled 15 Questions to Ask Your Wedding Photographer. Starting with camera bodies, our studio uses the most current and high-performing wedding photography camera bodies available to date, the Canon 5D Mark III and Mark IV. 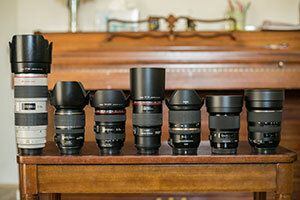 Each of our master photographers is equipped with one of the following primary and backup bodies. We also have photographers who are all Nikon (D4 D5 and D800 or D810) and Sony A7R III or II) which I'm not going to list here.